Android(s goog) phones may soon be the perfect partners for Chromebooks. 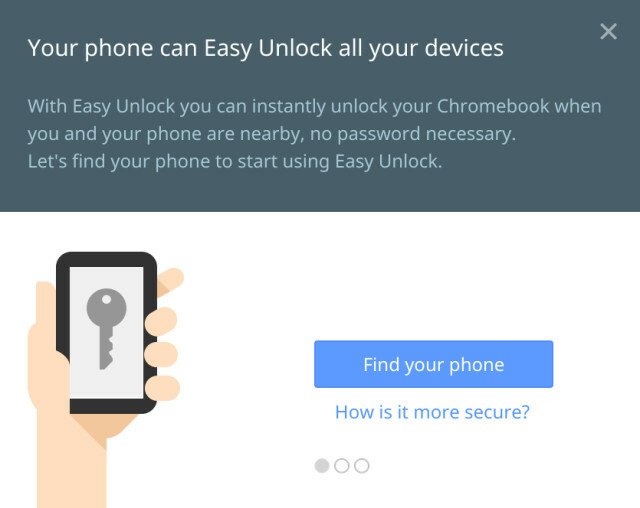 A new “easy unlock” feature appeared in the latest development release of Google’s Chrome OS software, allowing for a Chromebook to be unlocked simply by placing an Android phone next to it. The feature was spotted by Android Police, which found this informational screen after enabling the feature. Since I haven’t yet seen a Chromebook with NFC, or near-field communications, the linking here is likely done through Bluetooth. That’s a common feature found on phones as well as Chrome OS devices. And Bluetooth’s functionality has steadily improved with low-power communications that can be used for location purposes. In fact, my Moto X uses Bluetooth in a similar fashion, but in reverse: If I have a trusted Bluetooth device near my phone — a Bluetooth headset, for example — the handset won’t lock. The easy unlock feature isn’t yet complete. After enabling it, you’ll be able to see configuration options to set up your Android phone as a wireless key, but you can’t actually do that yet. My guess is that this feature won’t work until the June Google I/O developer event, as it could require an update to Android. It’s possible Google could release the feature sooner, but at this point on the calendar, it makes sense for it to be a part of the bigger Chrome OS and Android story on stage. Um. Yeah I want this ASAP, please. This sounds (no pun intended) a lot like SlickLogin, which Google bought back in February. It is SlickLogin. Google acquired them recently. Yeah agreed. It’s probably not using bluetooth but rather the mic on the Chromebook.